It’s that time of the year with the days becoming shorter and colder and people are spending more time indoors under cosy blankets – oh and mulled wine! In case you haven’t noticed yet: I absolutely love this time of the year! So colourful and refreshing after warm summer days (oh and also after my allergy season! 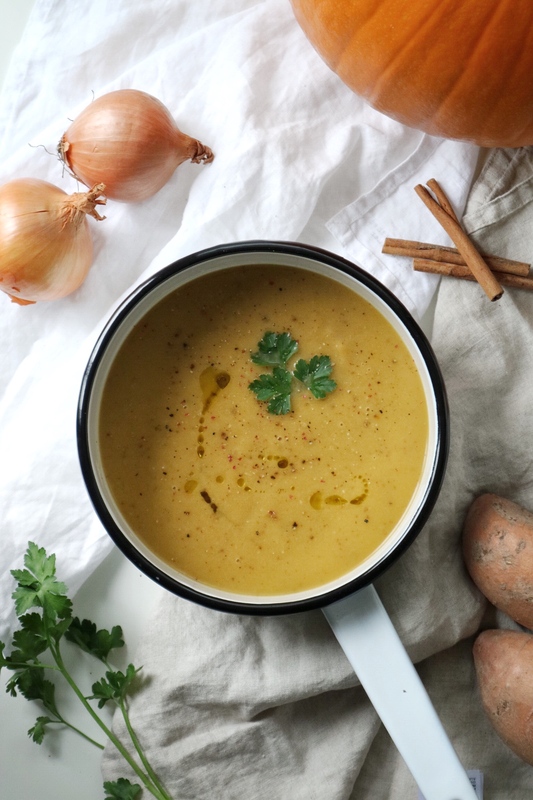 ), I love moving back indoors after a walk in the cold and enjoying a hot cuppa or a warming soup – a true hygge moment! But maybe it’s also the fact that the time is leading up to Christmas that makes this time of the year so magical! It’s also the time of the year where Starbucks cups and pumpkin spice latte’s turn up every where – especially on Instagram. Unfortunately these are still not vegan (ehem.. maybe a hint for you, Starbucks?! ), but it doesn’t mean I have to miss out on all the pumpkin flavoured goodness – I simply create my own! 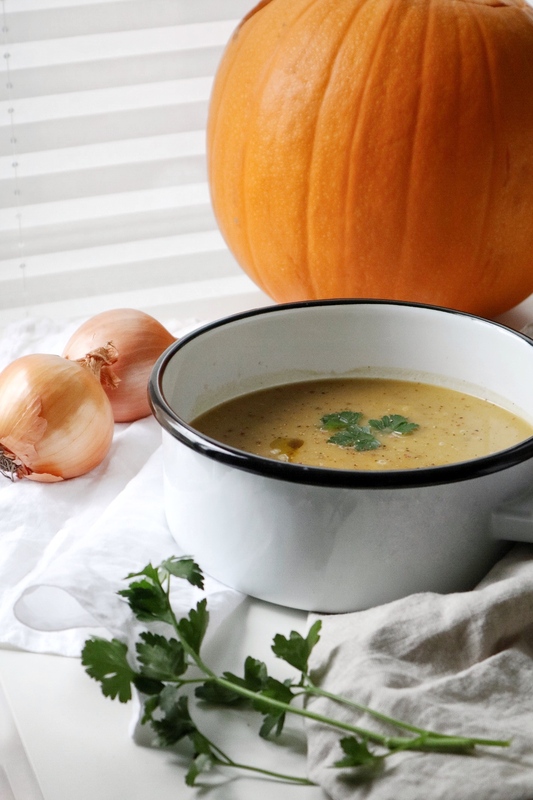 As mentioned above, there’s nothing better than a warming soup after a long walk in the cold, and one of my all-time favourites is this pumpkin soup! Also handy: with Halloween right around the corner I simply bought a pumpkin to carve and then used the pumpkin filling for my soup. optional: cayenne pepper for a spicy kick! 1. Add the coconut oil to a large saucepan with the minced garlic and let it roast on medium heat to release the aroma of the garlic. 2. Roughly chop the onion and add it to the pan. Let it simmer until the onion has softened, then add around 500ml of the vegetable stock and let it simmer for 15 mins on medium heat. 3. Add the pumpkin flesh – this can be roughly chopped as we will puree it later, however it cooks easier in smaller chunks. Sprinkle a little smoked paprika powder over the top and cover with the rest of the stock. Cover the saucepan with a lid and simmer for at least 40 mins. the Pumpkin will have softened by then and the flavours properly combined. 4. 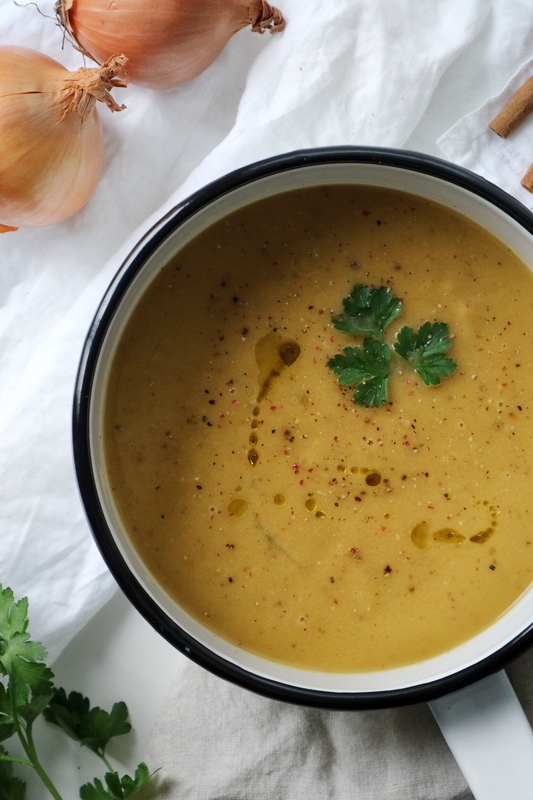 Once the cooking time elapses, add the soup to a blender and carefully blend until smooth. 5. Return the soup to the saucepan and add the cinnamon, salt and pepper, then stir well to combine and serve the soup hot. Tastes fantastic with a dollop of plain coconut yogurt on the top! Need recipe inspiration? Make sure to follow me on Insta!